Workshop hears of issues created by gap between growth in wages and productivity. In the period from 2004 to 2015, average wage and labor productivity increases in Vietnam were different from those seen elsewhere in Asia, Mr. Nguyen Duc Thanh, President of the Vietnam Institute for Economic and Policy Research (VEPR), told a workshop entitled “Labor Productivity and Wage Growth in Vietnam” held by VEPR on September 13 in Hanoi. According to the report of the same name, released at the workshop, growth in the minimum wage was higher than growth in labor productivity during the 2007-2015 period. The ratio of the minimum wage against labor productivity has experienced a rapid increase, from 25 per cent in 2007 to 50 per cent in 2015; a pattern not observed in regional countries such as China, Indonesia, and Thailand. “The gap between minimum wage growth and labor productivity growth in Vietnam has expanded faster than in other countries,” Mr. Thanh told the workshop. 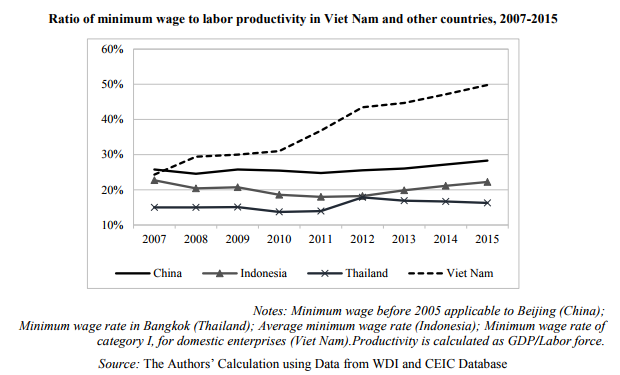 The report also pointed out that, in 2017, the minimum cost per worker, which is measured as the total of the minimum wage and contributions to social security (including social insurance, health insurance, and unemployment insurance), incurred by enterprises in Vietnam reached a level slightly less than in Thailand but higher than in Indonesia. “This rather high level of contributions to social security in Vietnam tends to create a ‘tax wedge’ between labor costs for employers and the take-home pay of employees,” Mr. Thanh added. During the 2004-2015 period, labor productivity growth in Vietnam was significant, at 4.4 per cent, but was outpaced by average wage growth of 5.8 per cent. He then explained that the misalignment between labor productivity growth and minimum wage growth and average wage growth, if it continues, will gradually but seriously disrupt the balance of the economy in many regards. “It will also prevent the accumulation of human capital, and reduce motivation among investors, the profits of enterprises, and the competitiveness of the economy,” he claimed. Mr. Futoshi Yamauchi, Senior Economist at the World Bank’s Development Research Group, told the workshop that, in general, an increase in the minimum wage results in an increase in average wages and a reduction in employment and profits. “Measured as profits over revenue, a 100 per cent increase in the minimum wage will likely lead to a 2.3 percentage point decrease in profit,” he said. Economists also spoke of policy implications. There are three key points: minimum wage adjustments should be in line with labor productivity growth; minimum wages are currently measured on a monthly basis but should be an hourly minimum wage; and the minimum wage should be adjusted under a rule-based approach and therefore more transparently and predictably. On August 7, a National Wage Council meeting decided that the minimum wage will be increased by 6.5 per cent in 2018, from between VND180,000 ($7.9) and VND230,000 ($10.5), depending on the region.